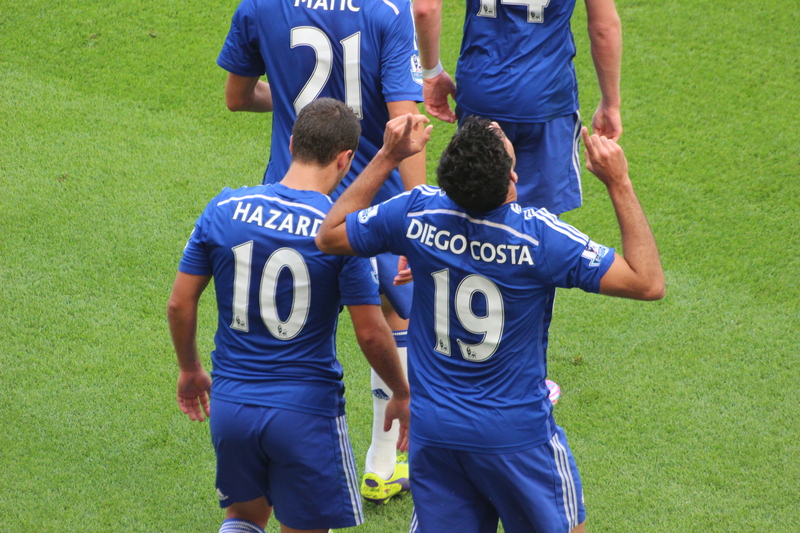 Chelsea vs. Leicester City : 23 August 2014. So, the 2014-2015 home opener against Leicester City on the Saturday of the August Bank Holiday weekend. A time to meet up with a few more Chelsea mates; I bumped into quite a few among the four thousand at Burnley on Monday, but here was a chance to chat to a few more. Monday’s game showed glimpses of a fine season to come. There were plenty of plusses, no more so than from the new starters Thibaut Courtois, Cesc Fabregas and Diego Costa. Leicester City, another of the promoted teams, would be full of fight but, surely, most Chelsea supporters would be hoping for a maximum six points from our first two league matches. Let’s begin strong. Let’s try to amass as many points against the lesser teams before we lock horns against the big four, five, six or seven. It would be time for me to continue to get my juices flowing for the season too. I have to be honest though; the final home game of last season, against Norwich City, was so lackluster, with a disappointingly subdued atmosphere too, that my memory of it left me wondering if I’d have trouble in getting “up” for the home opener of 2014-2015. This is a familiar theme here, isn’t it? I can only tell this Chelsea story from my perspective. Whatever will be will be, as the song goes. After the tiring pilgrimage to Burnley on Monday, my mate Glenn took a turn to drive for the Leicester match. It was a quick and easy drive east. We were soon parked up on Greyhound Road, just a mile or so to the north of Stamford Bridge. It is a strange fact that although I attend around twenty-five matches at The Bridge every season, my meanderings on match days do not extend far beyond a square mile of terra firma centered on the green sward of Stamford Bridge. From the North End Road heading south towards Fulham Broadway – the old Walham Green – then east along Fulham Road, past the stadium, up to Redcliffe Gardens, on to Old Brompton Road – just touching the southern boundary of Earl’s Court – and then west along Lillee Road, past the cluster of pubs around West Brompton. This marks the territory of my usual Chelsea match day experience. And it would be the path that I would take on this particular match day Saturday. At 12.45pm, I was patiently waiting at the bar in The Goose, when I felt a tap on my shoulder. I turned to my left and saw Eric, with his good lady Megan. They are both from Detroit and in town for the best part of a week. Eric is a keen footballer and plays regularly. Crucially, he has been a Chelsea fan for a number of years. I first met him in New York City ahead of our game with PSG in the summer of 2012. Thankfully our extended Chelsea family was able to secure a match ticket for the game. We retired in to the beer garden which was predictably busy on this sunny lunchtime. Our usual gaggle of Chelsea devotees stood in a small circle, sipping lagers, chatting, sharing jokes, laughing at Parky. It was a typical scene. It was just lovely to be sharing it all with Eric, who – I am sure – was looking forward to a Goose pre-match just as much as the main event at 3pm. My good friend Andy was able to regale the two Detroit natives of his visit to the city way back in 1987. I must visit Detroit one day – home to the Motor City Blues, of which Eric is a member – as it is one of the few major North American cities, along with Montreal, Phoenix, Nashville, Memphis, St. Louis and Badgercrack, Nebraska, that I am yet to visit. Eric and Megan had been enjoying a fine time in London since their arrival on Wednesday. On their first evening, despite being undoubtedly tired with jet lag, they embarked on a bespoke tour of a half a dozen gin bars, which took them through several different parts of the capital city. Visits followed to Buckingham Palace, the Tower of London, Westminster Abbey and the Churchill War Rooms below Whitehall. These are just the sort of attractions that I could or maybe should be visiting on my London excursions. While Eric would be watching the boys play, Megan was off shopping. We met up with Darren outside the CFCUK stall and the all-important ticket was handed over to Eric. He had a prime seat; second row of the Matthew Harding Upper, right behind the goal. Despite our plans to get Eric in to the stadium in good time, so he could experience a little of the pre-match atmosphere, we still found ourselves outside the MH turnstiles at 2.55pm. I was in, alongside Alan, Glenn, Tom and Joe, with a couple of minutes to spare. Stamford Bridge, with a sky full of small bursts of white cloud and stands full of sun-kissed spectators, looked a picture. It wasn’t easy to tell where home fans met away fans in The Shed. A thin line of stewards marked the boundaries. Leicester City would be backed by a healthy three thousand. Not too many were wearing replica shirts. I remember three specific games against Leicester City at The Bridge; the Erland Johnsen game in the 1996-1997 F.A. Cup run, a last-minute blooter from Frank Leboeuf in 1997 and Steve Guppy killing our championship campaign with another last minute goal in 1999. I had bought a match programme on the walk past the towering West Stand and the cover, design and layout is generally unchanged from previous years; well, since 2004-2005 anyway, when a new design was used. I’d suggest a new look. I’m getting bored with it. Throughout this season within the pages of the programme, there will be a retrospective on that 2004-2005 season. Was it really ten years ago that we assembled at Stamford Bridge to see how the new manager Mourinho would begin his Chelsea career in that game versus Manchester United? How time flies when you are winning trophies. Come April, it will be a decade since Bolton. Oh my. Incidentally, during that summer of 2004, I watched my five-hundredth Chelsea game (the Gianfranco Zola testimonial versus Real Zaragoza) and it had taken me a full thirty years to reach that mark. In the following decade, ten seasons, I squeezed in a further five hundred. Realistically, I doubt if my support for Chelsea will ever again reach such heights of fanaticism; these have been my roaring forties. It’s been magnificent. The first-half was a rather frustrating affair. Despite home advantage, the finer players, the more experienced manager, the most expensive signings, Leicester City – the new team at the top table – matched us. As the first period wore on, the exuberant Chelsea support began to quieten. And this disturbed me. I always wonder how many of the thousands at home games are first time visitors, like Eric, who have been drawn to our football and Chelsea in particular by the promise of a white hot atmosphere and associated boisterousness, only to be saddened by the quietness in the stands. It is always a concern. I’d hate every person’s first experience of a Chelsea match day to be underwhelming. I felt for Eric as the game progressed. Our play was not only slow and without focus, but Stamford Bridge was in one of its “can’t be arsed” moods. Despite the continued probing of Cesc Fabregas, who constantly attempted to thread a variety of balls in towards our attackers, and the earnest runs of Andre Schurrle, and the physical presence of Diego Costa, it was the away team who had just as much of the ball and just as many attempts on goal. Would this be the day that would be remembered for the individual performances of the two ‘keepers Courtois and Schmeichel? A fantastic tackle by John Terry on Mahrez was almost the most memorable moment of the first thirty minutes. Diego Costa began to be rewarded for his movement with a couple of half-chances, but his efforts were thwarted. As the half-time whistle blew, I envisaged Jose Mourinho waiting in the home dressing room with his smart phone and eleven ice bucket challenges. Certainly there was a need for a concentrating of mind and body. Mourinho needed to inspire and cajole, or – at worst – give the team a bollocking. At half-time, whispered words with my mate Rousey. One of his friends, Nick – who watched a mere ten feet away from me – had passed away a mere three weeks ago. His was a face that I recognised, though we never ever said more than a few words to each other. He will be missed by me and others. The second-half was a different story, thankfully. There was a more vigorous approach from the off. Soon into the half, a fine effort from the previously subdued Oscar rattled the woodwork, and then the forceful Ivanovic forced a fine save from Schmeichel. Schurrle was scythed down, but referee Lee Mason didn’t see red. Our World Cup Winner then came close. Approaching the hour mark, the home support was buoyed by this greater urgency and rewarded the team with a wall of noise from the Matthew Harding. At last! I hoped that Eric’s nerves were tingling. The Leicester ‘keeper was enjoying a fine game; his finger-tipped save from a rasping drive from Ivanovic, now very involved, was exceptional. Then, our hearts were in our mouths, as David Nugent – who seems to have been around for ever – broke with the entire Chelsea defence caught short. Miraculously, his low shot was deflected wide by the outstretched shin of Courtois, who had quickly advanced off his line as soon as he realised the severity of the situations. His angles were perfect. As the shot flew off for a corner, we roared. A penalty shout was waved away, and Schmeichel foiled a Fabregas effort. Our chances were piling up. Ivanovic was again involved with a bursting advance down the right. He found Diego Costa lurking centrally on the edge of the six yard box. A quick touch to bring the ball down and then a delicate prod past Schmeichel. I jumped up on to the steps to my left and roared. I don’t always do this; only for a “big” goal. Here was proof that this one was important. This was no run of the mill goal. This might just win us the points. Diego Costa was two out of two and he reeled away down below me with his arms outstretched. I instinctively grabbed my camera and snapped as he was engulfed by his new, thankful, team mates. As they eventually untangled themselves, I caught his double point to the skies. I noticed Didier doing this at Burnley after his fine touch and volley. It must be the new craze. I hope we see a lot more of this. Ramires and Willian came on for Schurrle and Oscar. What a squad we have this season. Leicester City, although clearly second best in this half, were still threatening. I told Alan that we needed a second to make it safe. With that, Eden Hazard, weaved in from the left down below me and hit a low shot towards goal. It was a move that we have witnessed on a few times before. I snapped a photo as he shot. A slight deflection sent it past the Leicester ‘keeper. Another roar. I watched as Hazard jogged over towards the Chelsea bench in that square-on style of his. Willian, as willing as ever, tested man of the match Schmeichel one last time. Outside at the Peter Osgood statue, Eric was all abuzz. I could tell that he had experienced a magical afternoon. He wasn’t physically shaking, but he wasn’t far off it. The night was still young and so we set off on a mini pub-crawl after picking up Dave and Jake. We called in for a drink at The Finborough Arms after a quick shower of rain and then The Pembroke, before we met up with Megan, post-shopping, for some pizza and Peronis at Salvo’s. On the adjoining table were ten Chelsea fans from Sweden. We all watched aghast as Arsenal equalised late on against Everton. Parky, however, hit the nail on the head. There was just time for one last pub and one last pint; The Imperial, just along from West Brompton underground station, where the post-Chelsea home game ska night was coming to a close, but where a smattering of a few famous and infamous Chelsea faces would be drinking long in to the night. We said our goodbyes. It had been a fine day. Dedicated to the memory of Sir Richard Attenborough. This entry was posted in Season 2014-2015 and tagged 2014-2015, Diego Costa, John Spencer, London, Pubs by Chris Axon. Bookmark the permalink.